I found this sketch a few years back, and one of these days I'll get around to framing it. Until then, I'll share it here. 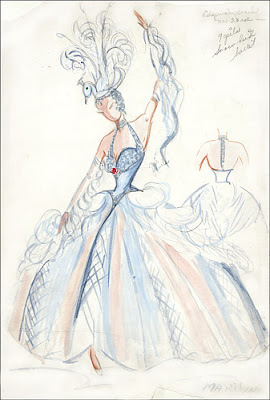 It's a design sketch for a costume used in one of the floor shows at the Edgewater Beach Hotel. Every month would bring a new floor show featuring top national acts from across the country and a line of dancers. Through the ’40s and ’50s, the Dorothy Hild Dancers performed there, and I imagine it was designed for her dancers. You gotta love the bird hat! The only identity as to the artist is the signature "Marilyn." The costume was to fit nine girls for the "Snowbird Ballet."